Laws Web Hosting offers UK Drupal Hosting with a full range of uk web hosting packages. Drupal is a free PHP software package that allows you to organise, manage and publish your content with a variety of customisations. 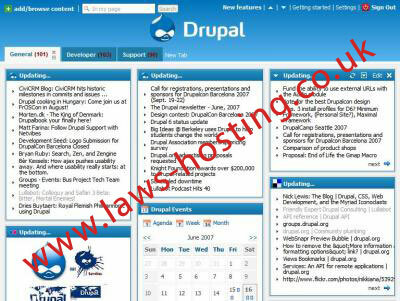 Laws Hosting specialises in drupal hosting uk for people who are unable to build a website from scratch. your site will be running in minutes with the help of our Installatron, our one-click software installer! One of the reasons UK Drupal Hosting is so popular is because it is easy to use and extremely flexible. It is absolutely free with all of our UK web hosting plans. We guarantee that Drupal hosting uk works flawlessly on our hosting platforms. If you're a web developer, you will like Drupal because it is customisable, web designers will like it because drupal is known for its professional appearance. Plus, there are already global markets for high quality extensions and templates, so talented developers for Drupal should be able to sell their work.